Does the Mega-selling Shake Weight Live Up to the Hype? BY MARK ANDERS WITH JENNAH HACKBARTH, M.S., JOHN P. PORCARI, PH.D., THOMAS KERNOZEK, PH.D., SCOTT DOBERSTEIN, M.S., TIMOTHY SUCHOMEL, B.S., AND CARL FOSTER, PH.D.
Over the past couple of years, the Shake Weight infomercials have gained something of a cult following in popular culture, primarily because some find that the way the models use the Shake Weight in the infomercial can be perceived as sexually suggestive. In fact, many television comedians and shows have done risqué Shake Weight spoofs, including Saturday Night Live, Ellen DeGeneres, The Daily Show, and even the animated TV show South Park. A quick YouTube search yields several very funny parodies. But officials at Fitness IQ say they don't mind the parodies and insist that these parodies probably have, in fact, helped to make the Shake Weight one of the best-selling fitness products in the nation. Better results in less time? It may sound too good to be true, but the buying public is, well, buying it. In its first year on the market, the Shake Weight sold more than 2 million units and has since surpassed the 4.5 million mark. A heavier, 5-pound version was also introduced for men and began selling briskly as well. In fact, Fitness IQ founder and Chief Executive Johann Verheem, the maker of Shake Weight, predicts the product will go on to sell 10 million units in its lifetime on TV. The Shake Weight is now also sold in stores like Walmart and Walgreens, where it is one of the best-selling fitness products on their shelves. The infomercials attempt to silence doubters by citing “independent” scientific studies: “A world leader in biomechanics showed it burns muscle energy and calories over five times faster than a dumbbell—this means a workout that takes 32 minutes with traditional dumbbells takes only six minutes with the Shake Weight...Shake Weight is science fact, not fiction." Based on consumers’ growing interest in the Shake Weight, the American Council on Exercise, the nation’s Workout Watchdog, commissioned a team of exercise scientists from the University of Wisconsin, La Crosse, to evaluate the degree of muscle activation when using the Shake Weight versus a traditional dumbbell of equal weight. Led by John Porcari, Ph.D., and Jennah Hackbarth, M.S., a team of researchers from the University’s Departments of Exercise and Sport Science and Physical Therapy recruited 16 healthy volunteers, both male and female, between the ages of 18 and 30 years old. Prior to testing, each of the subjects completed three practice sessions on three separate days to become well acquainted with using the Shake Weight. After learning the proper grip and use of the device (women used the 2.5-pound device, while men used the 5-pounder) each followed the official six-minute Shake Weight DVD workout that comes with the product. The short video leads subjects through four different exercises including the one-handed biceps shake, two-handed triceps shake, one-handed shoulder shake and two-handed chest shake. Each set lasts 15 seconds (30 seconds for men) and is followed by a two-minute rest period. All four exercises would later be replicated during the actual exercise testing alongside four equivalent common exercises, including the biceps curl, triceps extension, shoulder press and chest fly, using an equally weighted traditional dumbbell (2.5 pounds for women, 5 pounds for men). To measure the muscle activity during each exercise, researchers used surface electromyography (EMG). Recordings were collected from four muscles during each of the eight exercise tests, with electrodes placed on each subject’s biceps, triceps, deltoid and pectoralis muscles. Following each exercise, ratings of perceived exertion (RPE) were also recorded using the Borg 6-20 scale to determine how intensely the subjects felt they were exercising. 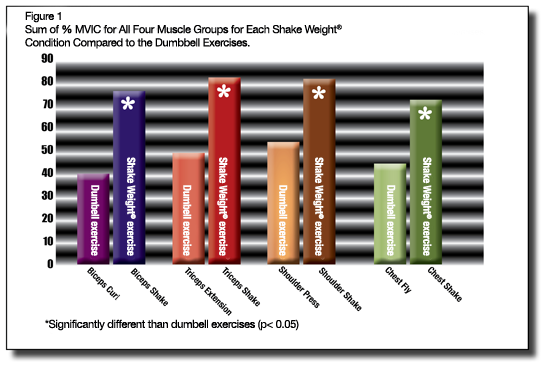 After crunching the numbers and data, researchers found that, across the board, the total EMG activity for all four muscles was significantly greater for the Shake Weight exercises compared to the traditional dumbbell exercises. In fact, on average, total muscle activity was 66 percent greater when performing Shake Weight exercises. Specifically, the total muscle activity was 88 percent greater when performing the biceps shake compared to the biceps curl; 65 percent greater for the triceps shake versus the triceps extension; 50 percent greater when performing the shoulder shake compared to the shoulder press; and 59 percent greater for the chest shake versus the chest fly (Figure 1). However, it is important to note that the increased muscle activation in this study was markedly lower than the EMG data touted on the infomercial (a 66-percent increase versus the 300 percent that the Shake Weight ad claims). The ACE-sponsored research team contacted the researcher who conducted the testing for Shake Weight, but he stated that he was not at liberty to share the data. Another interesting finding was that while there was significantly greater muscle activation in the Shake Weight exercises, the highest EMG values were usually not from the targeted muscle. In nearly every Shake Weight exercise tested, the triceps appeared to be working just as hard, if not harder, than the targeted muscle for each exercise. For example, during the biceps shake, the triceps was activated the most out of all four muscles evaluated. In fact, the muscle activation in the triceps was approximately 60 percent higher than the biceps muscle activity during the biceps shake. “The muscles the Shake Weight exercises are supposed to target are not always the ones targeted,” says Porcari. “For example, during the biceps shake, the muscle working hardest was the triceps because it’s providing the braking force, a co-contraction. And during the pectoralis exercise, the triceps is working the hardest." While the Shake Weight does indeed show more EMG activity, Porcari warns consumers to be sure to compare apples to apples when looking at this type of research. “Sure, it’s better than a two-and-a-half-pound dumbbell, but who goes to a gym and lifts two-and-a-half-pound dumbbells?” he quips. That said, it’s also important to note that the Shake Weight is basically an isometric exercise with vibrating tension that occurs in a very limited range of motion. So while you may gain some strength and endurance with the Shake Weight, those benefits would likely only be noticeable over a narrow range of motion. That begs the question: Exercise for what purpose? What is the true carryover benefit of the Shake Weight into real-life function? Based on the RPE data, there’s no doubt that many exercisers will feel initially quite fatigued from using the Shake Weight. Researchers warn, however, that the physical sensations you feel aren’t always reflective of the true impact or value of an exercise. “Of course you’ll be sore, because it’s not something your body is used to—it's working your muscles in a different way,” explains Hackbarth. Bryant asserts that while the experts at ACE are always hesitant to pan any exercise product that gets people up off the couch and moving (doing something is always better than not exercising at all), he also stresses the importance of taking advertising claims, like those made by Shake Weight, with a grain of salt. What are the traits of highly successful personal trainers? Obviously, a passion for fitness and a desire to help others are paramount. But all the knowledge and love for fitness in the world isn’t enough to guarantee your success if you can’t attract—and keep—new clients. Discover the strategies used by top-tier personal trainers that will help you grow your business and elevate you to the top of your field. For many, much of the stress of the holiday season comes from trying to find that perfect (and affordable!) gift for clients, friends and loved ones. This year, put your credit card away, skip the crowded malls and give a gift that will deliver more than just good tidings, but also good health and fitness all year long. Already in its sixth year, the 2011 ACE Fitness Symposium proved nothing short of a crowd pleaser. From high-energy activity sessions to the expanded vendor showroom, powerful and motivating keynotes to the Chobani Greek Yogurt tastings—fitness professionals of all levels from all over the globe had a blast at the event and learned a little something, too! Check out the full photo library of this truly unique fitness conference and tradeshow. Special guest speaker, Cornell McClellan, a member of the President’s Council on Physical Fitness, Sports and Nutrition, applauded fitness professionals attending the ACE Fitness Symposium for their huge efforts in giving back to our National Guard, activated military reservists and their families by supporting Joining Forces. Hear McClellan’s moving speech and learn more about how you can get involved in new initiatives to create a healthier America.